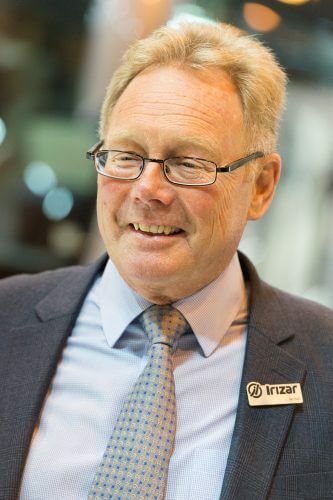 Ian Hall is to retire as one of the founding directors of Irizar UK Ltd at the end of May 2018. Besides the day-to-day running of the business in Worksop, he also handles coach sales in Scotland. Ian joined Steve O’Neill as Sales Director of the fledgling Irizar UK Ltd in 2011, having moved from finance into coach sales in 1991, first with Stuart Johnson Ltd, then the successor Scania companies, before forming BASE Ltd, with the Aspinall family. “I jumped at the chance to work with Steve O’Neill, who I had known as a customer from his time as Managing Director of The Kings Ferry, and a friend, for many years, when Irizar’s UK operation started in 2011,” Ian recalled. “I’d had an excellent relationship with the Spanish manufacturer, as it was my responsibility to sell it into the UK as coach bodywork for Scania. In the seven years since the formation of Irizar UK Ltd, we built the business to £25m turnover, and have delivered 350 premium-quality integral coaches to UK operators: a number that we expect to pass 400 by the end of the year. “The survival rate for that is just 6%,” he said. “But I was very fortunate to receive prompt and effective treatment. It proved to be a failed artery: so it wasn’t symptomatic of underlying disease or lifestyle factors, and I made a full recovery. “When I took on the Irizar UK project, I promised the factory a 10-year commitment to build the business up to an established level. “We’ve got there earlier than anticipated, and I’m able to hand over a clean business with great people to carry it forward. I will be retained on a consultancy basis to help with shows, factory visits and so on. Steve O’Neill, Ian’s co-director at Irizar UK, commented: “I met Ian back in 1994 when he first introduced the Irizar product to the UK and we purchased one of the first units at The Kings Ferry. We created a good working relationship then, so I was really pleased to get the opportunity to work alongside Ian when we formed Irizar UK.